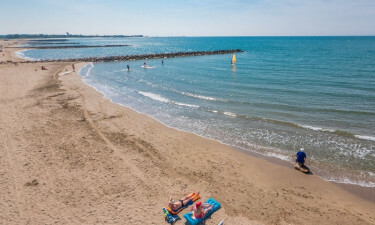 The luxury camping site of Club Farret is located within the famous Languedoc region of France and is ideal for any family-oriented camping holiday. With options available for active kids and grown ups, as well as places to unwind and relax, Club Farret has something for everyone. A choice of 233 pitches equipped with mobile homes and apartments. Direct access to the Mediterranean Sea. The ability to accommodate the needs of children and teenagers. Families can experience camping luxury while knowing that their younger ones are in good hands. The multilingual staff here is trained to entertain youths between 5 and 17 years of age. For up to 4 hours each day, children can engage in a wide range of activities such as arts, crafts, sports and team-building competitions. Fun outdoor activities including treasure hunts and local excursions will keep them occupied while their parents enjoy some much-needed rest and relaxation. While some may wish to sit back and relax, it is important to note that this luxury camping site provides numerous different activities to choose from. Beach volleyball, tennis, miniature golf and table tennis are only minutes from the mobile homes. 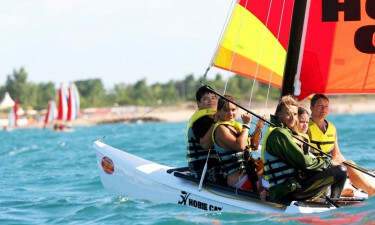 If visitors wish to venture outside of Club Farret, other options include boat rentals, surfing, sailing and a full golf course. Club Farret offers a restaurant that serves up only the finest Mediterranean cuisine. That said, guests will certainly look forward to tasting some of the local delicacies that are particular to this portion of France. A bar provides adults with a variety of different cocktails as well as a selection of the finest wines. During the evenings, live entertainment is another advantage that is not to be missed. Those who wish to eat within the privacy of their mobile home can order food such as pizza and burgers from a takeaway menu. A bakery within this holiday camping site provides fresh breads as well as pastries: ideal for a snack or a light breakfast. 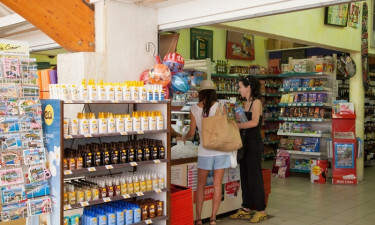 There is also a supermarket where guests can find fresh produce, meats, fish and other basic essentials for their camping holiday, including tobacco products, postcards and international newspapers. These facilities can all be accessed by foot and they are open throughout the tourist season. Should you wish to learn more when planning your next camping holiday, please contact LUX-camp as soon as you can. The perfect getaway is indeed only moments away!